On December 7, 1941, the Japanese attacked the United States naval base at Pearl Harbor to push America into the raging World War II. Disney, along with director Michael Bay ("Armageddon," "The Rock"), team up to help us re-live this sequence of events in U.S. History. Unfortunately, they tied in a storyline that is all too predictable, and sometimes boring. This three-hour saga contains only about 45 minutes of screen time dedicated to the actual Japanese attack. The other two-plus hours could have been left on the cutting room floor. Without spoiling the film, I can tell you that the bombing of Pearl Harbor is surrounded by a frustrating love triangle. This love triangle is so frustrating because of the film's predictability--the average moviegoer can easily figure out what will happen at each turn in the love story. The film was not entirely horrible. The overall acting was pretty good, considering the actors and actresses could only recite the lines given to them in the script. 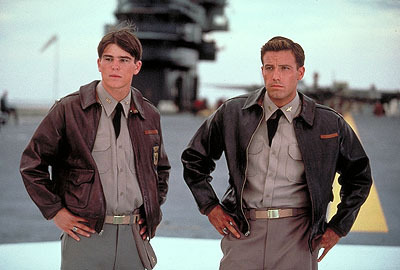 Ben Affleck ("Boiler Room," "Reindeer Games") and Josh Hartlett ("40 Days & 40 Nights") play best friends and U.S. Army fighter pilots who have known each other practically their entire lives. The characters are not as flawed as the story. You find yourself liking both guys throughout the entire movie, and you wish nothing but the best for both characters. Kate Beckinsale ("The Last Days of Disco") plays the beautiful nurse that both Affleck and Hartlett love. This causes the tension in the frustrating storyline. Jon Voight ("Varsity Blues," "Noah's Ark") as Franklin Delino Roosevelt is brilliant portraying the President in one of America's most trying times. Alec Baldwin ("Nuremberg," "State & Main") plays Colonel Doolittle, using his regular, egotistical, raspy voice. Cuba Gooding Jr. plays a simple Navy cook, who is good with his fists, and ends up being a battle-day hero. Dan Akroyd is cast as the Naval Intelligence officer in Washington, D.C. who saw the imminent Japanese attack coming weeks ahead of time. Overall, the cast is wonderful. The historical accounts are depicted well and leave us on the edge of our seats. But the love story ruined it for me. If you want a love story, rent "You've Got Mail." If you want a war story rent "Saving Private Ryan." See this film in the theaters because the big screen and Dolby Surround Sound is wonderful for the attack scenes. But you might also want to wait until "Pearl Harbor" is showing at the $1.50 discount theater instead of paying full price. The film is rated PG-13 due to combat style violence and mild sexual innuendoes. The film gets 3.5 stars out of 5 because I am a generous guy, and many scenes in the film were good.